In february 2008 something happened that would change my skills and my view of mapping forever. By coincidence, while searching for maps on the internet, I stumbled upon the Cartographers guild’s homepage. And what a treassure it turned out to be. I must say that of all things I know about mapping I’ve learned 75% since I joined the guild. It is a fantastic site full of information and nice people that are willing to share the knowledge they have. So if you’ve never visited the site, please do, you wont regret it. One of the hardest things when you map is to make your map interesting to look at. What exactly is it that takes a map from good loking to exciting to look at? I claim in no way that I have a universal solution to that problem but I do have some ideas that I try to follow when I make my maps. First of all I usually take inspiration from real life maps and locations. This tend to make the maps more belivable. I think that if you base your city on real life locations it will give the city a layout that we recognize, even though we don’t know anything about city planning, and in recognition you find beliving. The same goes for world maps and dungeon maps. Always try to base them on the real world. In this I don’t mean to just copy the real world completely, but more to find inspiration in it and try to put some of that inspiration in the map. Secondly I try to make a story around the map. If I’m mapping a village for example I usually try to think about where it is situated, why did people move there? Is it a safe area? What do people live of? How do they treat strangers? The idea here is to get some background of the place you’re mapping, this will make it easier for you to create something that in the end will turn out more interesting and belivable to lookt at. Let us look at a village I’ve made to explain this a bit further. This is Alvhem a small village near a forest south of the great town Ankh-Bathor. Villages are founded in places where people meet for one ore more reasons. When I made this map I had a map of the country Ankh-Bathor to start from. Here I’d placed likely locations for villages and cities. Places where people stopped for commerce, production and in some cases to sleep before continuing there jorney the next day. In the map below you can see Alvhem in the small red circle. Also the closenes to the hills and the marsh makes it an ideal place as a starting point for adventures. What is the lights you see in the marsh during nights? Where did the old miner dissapear after going in to the hills? But back to the village map. I started the village by drawing a crossroads and then puting in some houses. The best place to defend is probably the middle ground between the bridges so here I filled in som more houses. I also decide to place a temple on the north edge where the rivers combine, probably a temple for some river/sea god/godess. I also put in a large bulding in the middle of the village by the square, an inn for tired travellers to have some food and drink in. I continue to fill in houses this way, by thinking about what the need for the village is. After a while you will have a nice litle village that looks very belivable. But it won’t be very interesting. You need something more. Now is the time to fill in the litle extra. To get it interesting you need to have something that breaks the pattern of the map. Something that doesn’t follow what is expected. It doesn’t need to be much, just some small thing. In this particular map I’ve added a small temple in the forest slightly outside the village. This building will draw attention to it self because it is a part of the village but at the same time it is situated slightly outside of it. I probably could have put in some more things, but be warned less is often more as they say. So after having added the forrest temple I was satisfied and called the map done. The village of Alvhem is done i City Designer 3 from Profantasy. 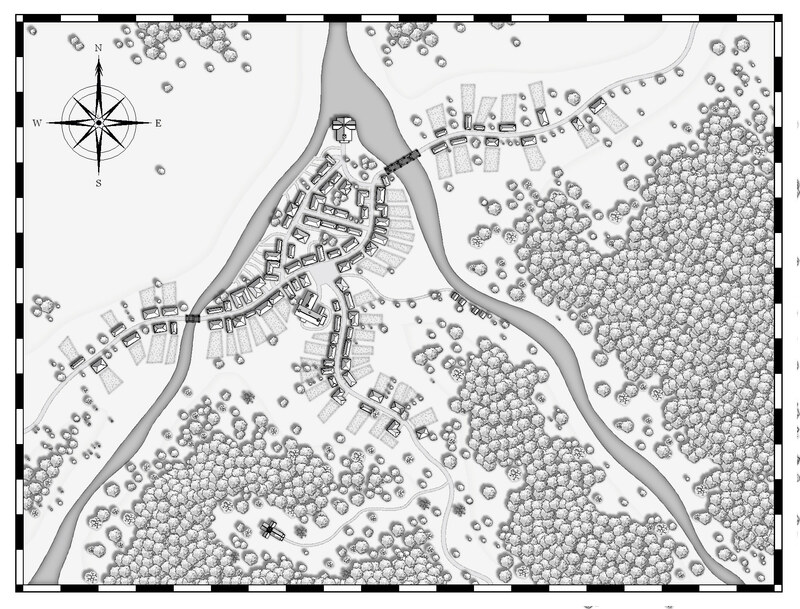 A great litle tool I really recommend to anyone that likes to make village/town/city maps. The overland map is done in Phtoshop CS5. I hope you enjoyed the post and that you maybe learned a bit or two about how I try to think when I’m making a map. Maybe it wont work for everyone, but it works fine for me. This is the first world map of the Etrakien world. After having finished the Nordhem map I decided that I needed a map of the whole world, that would make it easier for me to continue creating the story I’ve started to explore. As you can see from the map not much is kept from this first version (compare with the picture from my earlier post “My world and my maps”). First of all the complete world map is today much bigger, I’m coming to that in a later post. Secondly I didn’t lika a lot of the names of the countries, so they’ve changed. Some things are still there though. Like Ankh-Bathor that already here is a major trading city that connects the two sides of the world. 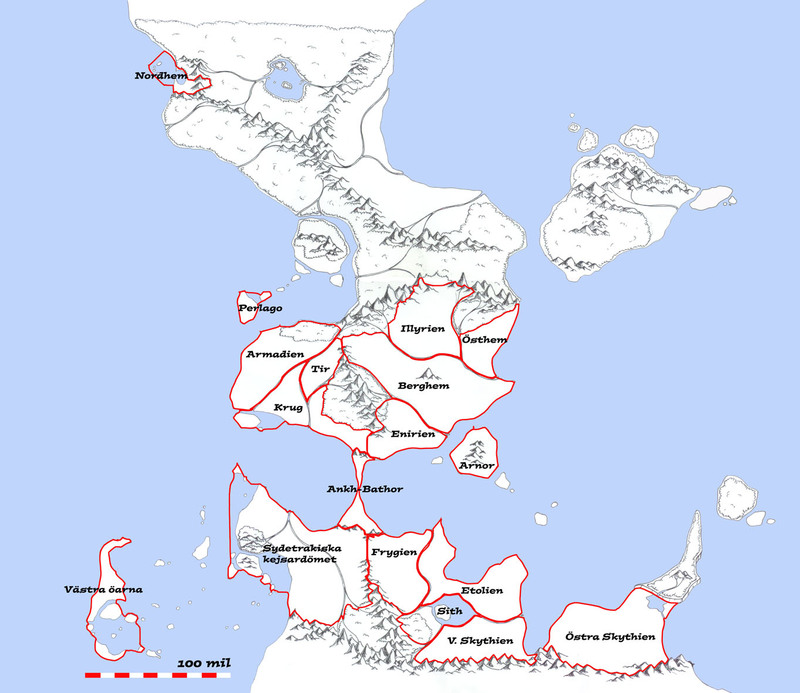 The Etrakien Empire is also situated south of the city. Krug and Armadien lies next to each other and a lot of the background story of the world was created at this time. The map was done on paper and scanned to the computer, it was still some time before I discovered the true art of map making in Photoshop. This is the first map ever done of the Etrakien world, it depicts the northern area called Nordhem. 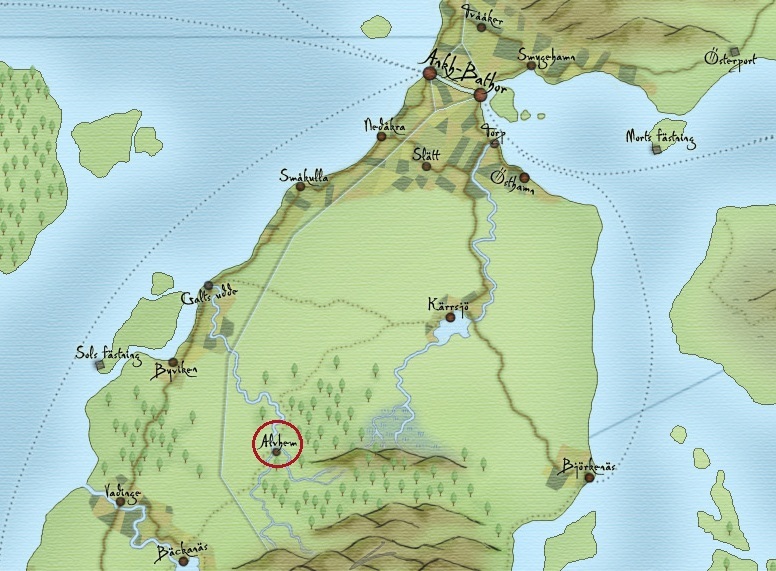 In very early sketches the area was called Nordheim, and the name has actually changed back and forth a couple of times. In some versions of the map I even decided to remove the area completely, but in my final map it’s actually back, but now as Nordheim. The map is drawn by hand and then scanned and edited in Photoshop. The only things added in Photoshop are the labelling. The map is done nearly ten years ago and much has happened since then when it comes to my drawing technique. Nowadays I seldom draw on paper, as I did by then, now I do the whole process in Photoshop with my Wacom pen. It makes the whole process much easier and quicker. And you don’t need to use the scanner (that is tucked away in a corner of my workroom) which is good. This particular map was originally done as a players map for a roleplaying session. By then I still had some ideas of putting my old gaming group together for a weekend. That never happened and I soon gave up on the idea of trying to make a roleplaying campaign out of it. However I didn’t give up on the world, which has continued to grow since then. But now it’s mainly there for one reason, to give me inspiration when I map. Most of the maps I draw depict the world of Etrakien in one way or another. So why create a world when it is maps I want to do? The easy answer to this is that it’s always easier to get inspiration for a map if you have a story around it. When you start to fill your imaginary worlds with life, death and adventures everything seems so much more interesting. And with interest comes creativity to evolve your work. So Etrakien has been around for quite some time, slowly evolving into a rather dark and sinister place, but not without its shiny good hearted places. While the story around the world has evolved so has the map as well. There are a couple of different versions of the world, part of the latest one depicted at the top of this post. Once you have a world to draw inspiration from it’s easy to find different objects to map, like cities, dungeons, countries, mines, catacombs. The list can be made as long as you desire. For me the whole Etrakien universe started out with a map of a northern region named Nordheim. I thought of it as a safe haven for people escaping war and famine in the south. Even though life in Nordheim was harsh and in many ways bleak it was still better than a life in a land badly scarred by wars. Soon I started to think of where all the people came from and names of countries like The Empire of Etrakien, Arnor, Ankh-Bathor and Krug came to life. What was the war about? Why did they fight? An idea of a struggling Empire trying to keep its grasp of the known world, but failing in all directions started to evolve. Old alliances where broken, savages from the northern woods came flooding in with death in its path. As you can see one thing led to another and after some years of mapping the world has stabilised, the fallen empire still exists licking its wound and looking for an opportunity to re-establish its power in the world. But new kingdoms have risen from the ashes of the burned and scarred lands, new allies have been made and none of them have an interest in an old power regaining its strength. And this world just screams for another map! When I map I mainly use two different programs, Photoshop from Adobe and Campaign Cartographer 3 (CC3) from Profantasy. The programs are also used for different type of maps. When I make world maps I prefer the freedom you have in Photoshop vs CC3, that is more of a cad program with predefined symbols that you place on your map. Where CC3 really shines is when you add in the two expansions City Designer 3 and Dungeon Designer 3. They really gives you great tools and predefined styles when it comes to making cities and dungeon/interrior maps. All maps I do however are always finished up in photoshop. In that way my CC3 maps can get a more unique look to them. This page is about mapping worlds. Not real ones but imaginary ones. In my spare time I like to draw maps of fantasy worlds, mainly of my Etrakien world. But apart from that I ususally draw maps of all kind of places. On this page I will present the maps I’ve finished, some ongoing projects and some maps that never made it all the way, but that have parts that I’m fond of.